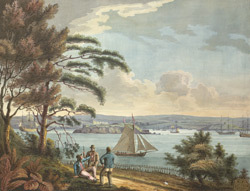 View of Drake's Island and the Citadel of Plymouth, with Cat Water, Mount Batton and the Plymouth Sound, as seen from the cottage on Mount Edgcumbe.. This was also sometimes called St Nicholas Island or St Micheal's Isle. During the reign of Henry VIII there were no fortifications here and only the small St Micheal's Chapel. However the Isle was in a good location to provide a means of defence for Plymouth. By the late 18th century it was well defended with a fortress and the chief defence for Plymouth Sound.